The video for this story about Leonard Hart and the Passchendaele offensive screened on TV3 News on 7 August 2014. The battle of Passchendaele represents the blackest day in New Zealand’s history. Far more New Zealanders died in a few hours on the morning of 12 October 1917 than on any other day in the country’s known history. Leonard Hart was one of the New Zealand soldiers engaged in the battle that day. His letter to his parents, which was smuggled out to avoid military censorship, is the most vivid extant record of the horrors of the battle. The battle that took place on 12 October 1917, beneath Passchendaele Ridge in Belgium, proved to be the New Zealand Division’s costliest day. The loss in those few hours represents the highest number of deaths New Zealand has experienced on a single day since European settlement. By the end of the day 846 men of the New Zealand Division were dead or dying and 1855 men were wounded (of this number, 138 would die of their wounds within the week). Leonard Hart was the son of a lighthouse keeper and grew up in remote locations around New Zealand before becoming a railway clerk in Southland. In 1915, aged 21, he enlisted in the New Zealand Expeditionary Force and served at Gallipoli, before being evacuated to hospital in Egypt to be treated for enteritis. Once he had recovered, he was sent to the Western Front, where he experienced horrors worse than those seen previously at Gallipoli. In a 40-page letter to his family, sent a week after the battle of Passchendaele, Hart wrote a vivid and laconic account of the horrors, and the despair, he had experienced there. Hart managed to send the letter via a soldier who was going on leave to England, thereby bypassing the military censors who would have removed many of the details of his letter. His comprehensive account gives his perspective on the experiences of the New Zealand Division at Passchendaele. After their tough times on the Somme in 1916, the New Zealand Division went north to Flanders. There, General Sir Douglas Haig, Commander-in-Chief, British Expeditionary Force (BEF), planned an advance north/north-east through the German lines near Ypres to capture the Belgian ports of Ostend and Zeebrugge, where German U-boats were based. Before the advance could begin with any chance of success, the German position on Messines Ridge had to be captured. With meticulous planning, this was successfully achieved on 7–9 June 1917 and, although the New Zealanders suffered heavy losses (3700 total casualties), the victory improved morale. The next task was to advance from Ypres and capture Passchedaele Ridge. Beginning on 31 July, the British made slow progress. The New Zealand Division became involved with an attack on Broodseinde Ridge on 4 October. Broodseinde was the last major obstacle before Passchendaele Ridge. The New Zealanders were charged with capturing the Gravenstafel Spur and, despite heavy loss of life (with 350 dead), they advanced 1000 metres and succeeded in their objectives. It had been a wet autumn and now the rains returned. The area became a muddy moonscape of shell-hole craters. The British attacked again on 9 October and, hampered by the conditions, they failed miserably. But Haig was convinced the Germans were close to breaking. So another attack, the first battle of Passchendaele, followed three days later. The New Zealand Division’s 8-kilometre march to the front line on the night of 10–11 October was slow and difficult. The ground was a former battlefield, churned up by repeated shell fire. Bombardments from earlier battles had destroyed the delicate natural drainage of the stream valley beneath Passchendaele Ridge. Persistent heavy rain and the movement of entire armies over unsealed roads turned the ground into a morass of thick mud. Due to the mud, getting the artillery in place at the front line was nearly impossible, as pack animals struggled in the quagmire. The few guns that did reach the forward positions lacked stable platforms, which greatly affected their accuracy and rate of fire, as they constantly needed to be reset. 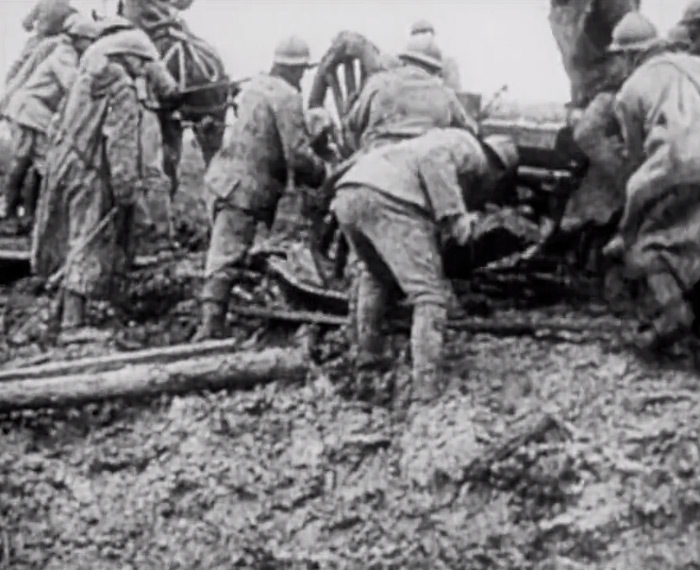 Furthermore, only about 20% of the optimum supply of field gun ammunition made it through the mud, and each piece then needed to be washed clean. The men of the New Zealand Division, exhausted from the march and a major battle at Gravenstafel the week before, relieved their British comrades and dug makeshift trenches in preparation for an attack the following day. At 5.25 on the morning of 12 October, the Allies’ artillery units opened fire on the German defences along a 10-kilometre front. It is clear that the Germans were aware of the impending attack as they sent up many flares and initiated a heavy artillery bombardment 25 minutes before Allied zero hour. It is claimed that a Scottish deserter captured at midnight had warned the Germans of the planned attack. Once it started, the artillery fire in the New Zealand Division’s sector was feeble and erratic. The New Zealanders suffered losses not only from German artillery counter-fire, but also from their own artillery shells falling short of their target. As the New Zealand infantry started their advance, they discovered that most of the Germans’ two lines of barbed wire and the heavily fortified German machine-gun pillboxes (defensive bunkers), which should have been destroyed by the barrage, were left undamaged. Due to the thickness of the mud, shells that landed near the pillboxes merely threw up a fountain of mud but did little material damage. Attempts to cut through the thick tangle of wires were futile, as they encountered heavy enemy machine-gun fire from the front and sides, as well as sniper fire from German troops hidden in positions behind them. The New Zealanders dug in or sheltered in shell craters, having gained a few hundred metres of no-man’s land which was still dominated by the German positions above. Mercifully, an order for a renewed advance at 3 p.m. was cancelled at the last minute. Over the next 48 hours, efforts were made to evacuate the wounded men from the battlefield, many of whom were entangled in the barbed wire. The men even found some British survivors from the failed attack in the same area on 9 October. It took a party of six to eight men between six and twelve hours to carry a stretcher across 5.5-kilometres of mud to the nearest dressing station. The battle at Passchendaele was probably the heaviest fighting ever experienced by New Zealanders. The ratio of dead to wounded was unusually high due to the efficiency of the well-trained German snipers, as well as the machine gunners’ vigilant guarding of any breaks in the barbed wire. Despite the 3000 New Zealand casualties (both dead and wounded), no military objectives had been achieved that day. Although newspapers in New Zealand initially reported Passchendaele as a success (although one hindered by the weather or ‘superhuman’ German resistance), morale plummeted amongst the soldiers of the New Zealand Division, with many blaming their ‘armchair leaders’ for sending them into a deathtrap. Leonard Hart’s uncensored letter urged his family to disregard the ‘glorious success’ reported by New Zealand’s ‘lying press’. Of the 180 men of Hart’s unit (2nd Battalion, Otago Regiment), only 32 survived Passchendaele unscathed. A huge number of families in New Zealand’s wartime population of one million were greatly affected by the events of 12 October 1917. Hart continued to serve in the Passchendaele sector between October 1917 and 12 February 1918, when he was badly gassed by a mustard gas shell near Polygon Wood. He was evacuated to hospital in England, then sent back to New Zealand in September. He spent a year with his parents recovering from the effects of the gas at Cape Palliser lighthouse on the southern Wairarapa coast. Once free from ill health, and the misfortune of becoming involved in an unsuccessful business venture, he attempted to take up his old job in the Railways Department. Although the government had promised that all returned servicemen would be able to return to their pre-war jobs, it was not a promise the railways, or indeed most employers, honoured. The department initially argued he was medically unfit, and it was not until 1921 that he was able to take up his former job. With his experience, Hart was welcomed back to the New Zealand military forces during the Second World War. He was based at Feilding from July 1940 until February 1942, when the manpower committee sent him back to the railways, where he stayed until his retirement. All Leonard Hart’s letters are in the Alexander Turnbull Library at MS-Papers-2157. Leonard Hart’s letter to his family, dated 19 October 1917. Full transcript on NZHistory (PDF). Letter from Leonard Hart to his family, dated 2 November 1917. The men of my company who fell in our recent stunt [Passchendaele] were among the finest and best I have known and it will take a long time for one to pick up comrades like them again. An easy-going, generous and sociable crowd – many of them old hands who had been through every stunt in which our division has been engaged since coming to France. Things seem quite different now that they are gone and their faces filled with strangers. Letter from Leonard Hart to his family, dated 15 December 1917. We are back in that sector of which I told you in my last letter, only about a couple of miles further to the right of the place where we went over the top. It is almost as bad so far as desolation, death, and mud are concerned as that place. 'Haig Attacks on Six-Mile Front', Dominion, 15 October 1917. 'Progress of the War', Dominion, 15 October 1917. 'Fifth Fight for Passchendaele Ridge', Wanganui Chronicle, 15 October 1917. 'New Zealanders Held Up', Evening Post, 16 October 1917. 'New Zealanders Assist to Attack Passchendaele', New Zealand Herald, 16 October 1917. 'New Zealanders' Gallantry', Auckland Star, 17 October 1917. 'New Zealanders' Heroism', Press, 17 October 1917. Leonard Hart reported wounded, Otago Daily Times, 5 March 1918. The following interview extracts are sourced from Nicholas Boyack and Jane Tolerton, In the Shadow of War: New Zealand Soldiers Talk About World War One and Their Lives, Auckland, 1990. What effect do you think Passchendaele had on morale? It was devastating. It was such a futile thing, there seemed to be no definite plan, it was just a slog. Just go over the top and wade yourself through mud and slush and shell holes and water and broken wire. I think you’ve got to attribute the blame to the higher command, their insistence upon carrying on with these futile campaigns. It was really just slaughter, there were no strategy or tactics, it was just sheer weight of numbers trying to push their way through. And the Germans of course, they were there to stop us and the ground was ploughed up with shell fire and it was very difficult to make any progress. Interview with Stan Stanfield. Audio of some extracts available at NZHistory. It rained and rained and bloody rained, and rained and rained, see. Just like here in the autumn time, when it comes to rain and it was cold. And we were picking them up from a gathering point as a regimental aid post. Well there were hundreds of men laying out, around. You couldn’t get them inside, it was an old German concrete emplacement and you couldn't get them all inside, but the doctors were working inside. And they were just laying around where they’d been dumped by the stretcher-bearers from off the field and at one period I believe there were 600 stretcher cases laying round the place in the wet and cold, just dying there where they were dumped off. They weren’t even laying on stretchers, just laying on the ground with an oil sheet tied over them if anyone thought to do that, or if one of their mates could do it. Just laying there, because the stretchers were used for picking up other men, you see, there couldn’t be a stretcher for every stretcher case. We just carried till you couldn’t carry more. You just went until you couldn’t walk really, you just went until you couldn’t walk…. An ordinary infantryman at Passchendaele was a pretty dumb beast. That’s how he’s treated, you see. He was only gun fodder and when all is said, and that’s what I feel. We were pretty dumb beasts you see, or we wouldn’t have been slapped, thrown into that sort of warfare, because it was hopeless before you started. We all knew that…. By the time we left Passchendaele… they [The New Zealand Division] were back to a C-class division, their morale had got low. We’d been hammered too hard and of course your morale got low; the old soldiers were all gone, sick, knocked out and one thing or another, and you had too many fresh reinforcements from New Zealand, not toughened up. It takes time to toughen a man up. The state of the ground meant that the shells were just flopping onto the ground and exploding and causing no damage at all. So the wire wasn’t cut very much. Our infantry went over the top, and of course the Germans were on a bit of a rise up to the village of Passchendaele. They had their machine guns there and they simply mowed our men down. It was really a disaster day. We had quite a few thousand killed and wounded and some battalions were almost decimated…. [E]very time we fired a shot our gun would just sink into the mud and we’d have to lever it out and lay it again before we could fire another shot… And the barrage that was put over was very very weak because they weren’t able to get all the guns that they wanted into position…. It upset the men to think that they were put into a situation like that, endeavouring to take Passchendaele when it was absolutely impossible. And it impressed on me the futility of war. In our battery there used to be grerat arguments between the men who were at Gallipoli and the men who were on the Somme and Messines and Passchendaele as to which was the most important, which was the most ghastly. Of course it was never resolved really. But I think Passchendaele’s looked upon as the muddiest and bloodiest battle of all time. There was never any carnage at Gallipoli as there was at Passchendaele. Now on the 12th of October, because the brass hats back country decided to put another blitz on – they were going to make another advance on Passchendaele…. There was insufficient artillery preparation and it was a sheer massacre. Boyack, Nicholas, and Jane Tolerton. In the Shadow of War: New Zealand Soldiers Talk About World War One and Their Lives. Auckland: Penguin, 1990. Gray, John H. From the Uttermost Ends of the Earth: the New Zealand Division on the Western Front 1916–1918: a History and Guide to its Battlefields. Christchurch: Wilson Scott, 2010. Harper, Glyn. Dark Journey. Auckland: HarperCollins, 2007. Phillips, Jock, Nicholas Boyack and E. P. Malone, eds. The Great Adventure: New Zealand Soldiers Describe the First World War. Wellington: Allen & Unwin/Port Nicholson Press, 1988. The Passchendaele offensive, a story on NZHistory. Passchendaele, information about the battle of Passchendaele on the Auckland War Memorial Museum website. Western Front, 1916 to 1917, a page on Te Ara about the Western Front during the First World War.